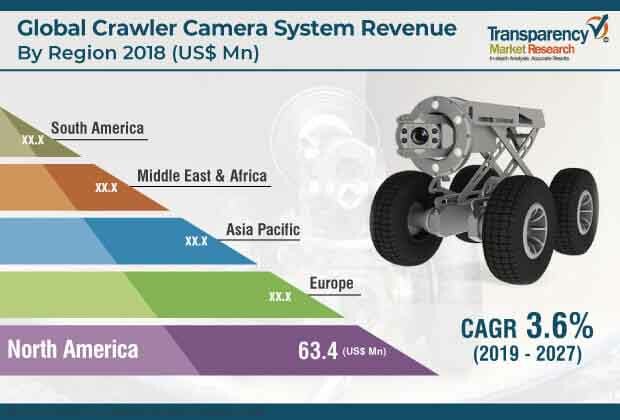 According to a new market research report published by Transparency Market Research the global crawler camera system market is expected to reach value of US$ 187.6 Mn by 2027, expanding at a CAGR of 3.6% from 2019 to 2027. According to the report, the market would continue to be influenced by a range of macroeconomic and market-specific factors. In terms of demand, North America is likely to continue to lead the global market, with the market in the region expanding at a CAGR of 3.8% from 2019 to 2027. The U.S. is anticipated to be a major contributor to the crawler camera system market in North America during the forecast period. Crawler camera systems used in pipeline inspections employ a number of approaches to provide the desired information. These systems have the capacity to detect deposits, corrosion, and cracks in pipelines. In recent times, inspection by using crawler camera systems has become popular. In addition to this, these systems are portable in nature. They are equipped with CCTV cameras and internal batteries, which provides ease of access to any remote location. Crawler camera systems do not require dedicated trucks or complicated systems for pipe inspection. Manufacturers of crawler camera systems worldwide are continuously investing in and adopting new, technology-based cameras and lighting systems in order to improve the efficiency of crawler camera systems. These systems are employed in different end-use applications such as municipal, residential, commercial, and industrial. The crawler camera system market has been recently gaining traction, due to increasing demand for remote-operated inspection systems across the world. Crawler camera systems are being widely adopted in manufacturing, industrial, petrochemical, and residential applications, as they offer efficient and rapid inspection of pipelines. This is likely to fuel the global crawler camera system market in the next few years. Manufacturers of crawler camera systems across the globe are increasing their investments in crawler camera systems in order to meet the increasing demand from various applications such as drain inspection, pipeline inspection, and tank, void, cavity or conduit inspection. The global crawler camera system market has been broadly segmented in terms of component, application, end-use industry, and geography. Based on component, the market has been segmented into camera, crawler, cable & cable drum, control units, and others. In terms of revenue, the camera segment accounted for a major share of more than 34% in 2018. The segment is anticipated to expand at a CAGR of 4.0% during the forecast period. In order to fulfill the global demand, various manufacturers of crawler camera systems are focusing on research and development activities on a regular basis in order to invent advanced applications of crawler camera systems. Based on application, the global crawler camera system market has been segregated into drain inspection, pipeline inspection, and tank, void, cavity or conduit inspection. In terms of revenue, the pipeline inspection segment held the maximum market share in 2018. In addition to this, in terms of both value and volume, the pipeline inspection segment is expected to expand at the maximum CAGR during the forecast period. Based on end-use industry, the market has been classified into residential, commercial, industrial, and municipal. In terms of revenue, the municipal segment accounted for a major market share of more than 40.0% in 2018 and it is anticipated to expand at a CAGR of 3.9% during the forecast period. As per TMR analysis, North America accounted for a leading i.e. more than 45% share of the global crawler camera system market, in terms of both revenue and volume, in 2018. The market in the region is primarily driven by increased investments in modernizing of infrastructure and rise in awareness about pipeline inspection in the region. The global crawler camera system market is expected to witness further modifications, innovations, and advancements in crawler camera systems in the near future, as several leading manufacturers are incorporating value-added components into their existing products. The research study includes profiles of leading companies operating in the global crawler camera system market. Market players have been profiled in terms of attributes such as company overview, financial overview, business strategies, and recent developments. Some of the key players operating in the global crawler camera system market are AM Industrial (UK) Ltd., CUES Inc., Deep Trekker Inc., Inuktun Services Ltd., iPEK International GmbH, Kummert GmbH, Mini-Cam Ltd., Rausch Electronics USA, LLC, Subsite Electronics, and INSPECTOR SYSTEMS Rainer Hitzel GmbH. Various business strategies are being adopted by leading market players. Companies are focusing on expanding their business by developing strategic partnerships and offering innovative solutions.